The love that develops between Luke Rowan and Rachel Ray is not universally welcomed. Mrs. Tappitt- a rich, influential, and bad woman - wishes him to marry one of her own daughters, while Rachel's mother and older sister are not sure he is worthy of her. After many adventures, everybody gets what they deserve. Characteristically to Trollope's works, there is also a secondary plot involving the election of parliament in Baslehurst. Not Trollope's best effort, but still great fun. 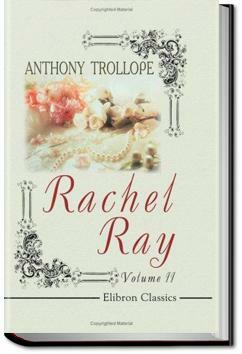 This modest, medium-length novel is one of Trollope’s best, and it has an interesting backstory. Absolutely and completely delighful, happy read. :) From my limited Trollope reading so far, I take back what I said about beginning him with "Ayala's Angel" and think THIS book a far better representation of the general feel and scope of his work.